I just wanted to convey my thanks for your extremely prompt and efficient service in changing the size of the PCW Dogmatic. My replacement size 2 arrived today. It is a better fit. I have just returned from walking my dog, and although she didn't like wearing it, for the first time in nearly 3 years and, after trying numerous non pull walking aids, I almost didn't know I had a dog on the end of the lead!!! pulling free and no riding up to her eyes. Thankyou. 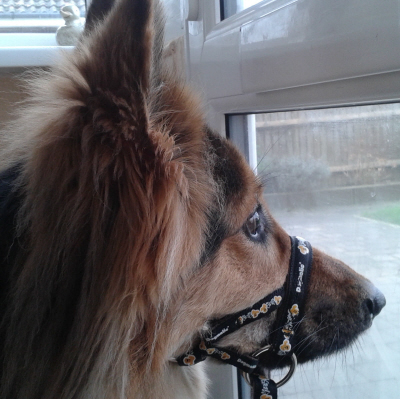 I've attached a picture of my dog wearing her dogmatic. Our walk this morning again, was delightful for me-no pulling. I was getting to my wits end after three years of constant pulling, with nothing seeming to stop it. Can't believe its happened so quickly. She is protesting at having to wear the dogmatic, but I will persevere, I'm sure it wont take long for her to get used to it . I'm a very happy dog walker.